“I believe that being loyal to ourselves, work, nationality and national races would contribute to the country’s development. In addition, there should be unity among colleagues, citizens and national races. Likewise, the lack of country loving spirits may lead to disunity. So, there should be country-loving spirits, patriotic spirits and Myanmar spirit, said Commander-in-Chief of Defence Services Senior General Min Aung Hlaing, at the second ceremony to make cash donations for security personnel and state service personnel who risked their lives while shouldering national defence and security duties and ethnic natives who fl ed their homes due to brutal attacks of ARSA extremist Bengali terrorists and for border fencing, at Zeyarthiri Villa in Yangon Command Headquarters, this evening. The ceremony was attended by Commander-in-Chief of Defence Services Senior General Min Aung Hlaing, Commander-in-Chief (Navy) Admiral Tin Aung San, Commander-in- Chief (Air) General Khin Aung Myint, senior military officers from the Office of the Commander-in-Chief (Army), the Yangon Region Command Commander and donors. In his speech, the Senior General said the Bengali issue in Rakhine State occurred in the colonial era since before the country regained its independence. Efforts to solve this problem by the successive governments went unfinished. Nowadays, the UN’s role became broader. Voices of human rights became louder. 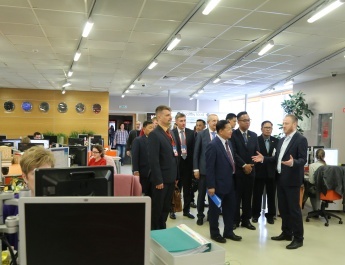 Authorities had to tackle the problems gently as the error became the truth and the truth, the error. 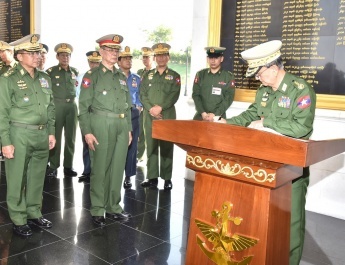 The Tatmadaw would perform its duties fully in accord with the laws. The root cause of the current problem was they refused to get scrutinized according to the 1982 Citizenship Law. The term“Rohingya” was not present in the country’s history. The term “Bengali” was used since the colonial era. The country could not accept and recognize the term “Rohingya” by hiding the truth. Rakhine ethnics are only our indigenous people who had long been living there since the time of their forefathers. All citizens needed to have unity, patriotic spirits and do works rightfully. Media were urged to cover the correct news extensively. The Senior General said he respected and valued well-wishers who donate money with the country loving spirits, patriotic spirits and sympathy towards national races. The Commander-in-Chief accepted Ks-3,169 million donated by the Brighter Future Foundation, Ks-633.8 million by Gate Ways Group of Co, Ltd, Ks-30 million by Yangon Tipitaka Yanbye Sayadaw and party, Ks-20 million by Myanmar Economic Holdings Ltd (Head Office), Ks-18.2 million by Myanmar Economic Corporation and partner companies and cash by two well-wishers, for border fencing. Commander-in-Chief (Navy) Admiral Tin Aung San accepted Ks-100 million donated by Kaythar Co Ltd, Ks-150 million by Rakhine Social Group of Phakant Region, Ks-70 million by Mandalay Rakhine Social Group, Ks-50 million by Miya Win Co Ltd, Ks-15 million by Rakhine State Disaster Rescue Committee (Yangon) of Yangon Region and Ks-10 million by Asia World Foundation. Commander-in-Chief (Air) General Khin Aung Myint also accepted Ks-10 million donated by fourth communication provider Mytel Co Ltd, Ks-6.3 million by 18 partner companies of Myanmar Economic Holdings Ltd, and Ks-5 million each by graduate officers from No 20 Intake of Defence Services Academy and families, Hnalonhla Myittashinmyar Foundation, Myawady Bank Ltd and Copper Mining (Monywa). 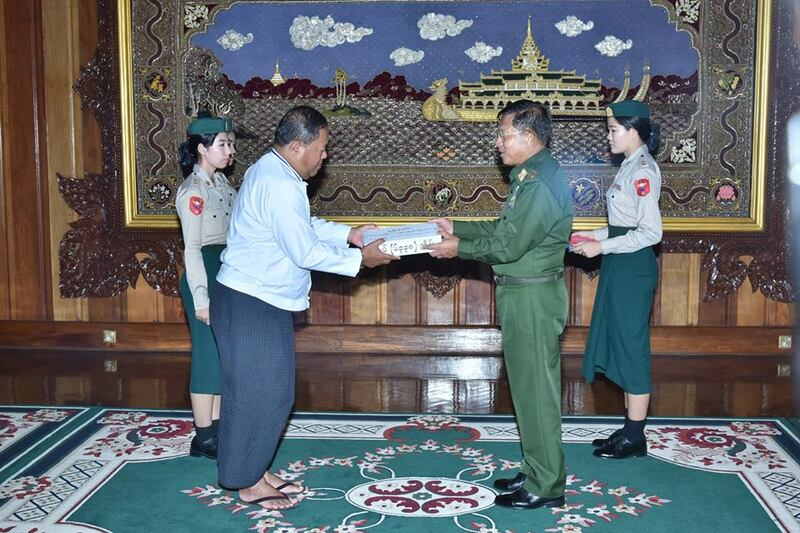 Lt-Gen Myo Zaw Thein of the Office of the Commander-in-Chief (Army) accepted Ks-26 million donated by six well-wishers and Yangon Region Minister for Rakhine Ethnic Affairs U Zaw Aye Maung, Ks-32 million from 11 well-wishers. Afterwards, the Yangon Region Minister for Rakhine Ethnic Affairs spoke words of thanks. First and foremost, he expressed gratitude of the Tatmadaw for safeguarding life and property of Rakhine ethnic people. In 1942 when Bengalis killed local Rakhine ethnics with arms given by colonialist British, only when BIA troops rushed to the scene, had Rakhine ethnics got chances of life. In that incident of terrorism, the Tatmadaw could protect local Rakhine ethnics in time. Likewise, whenever Rakhine State faces natural disasters such as earthquakes, storms and flooding, Tatmadawmen always give a helping hand to local ethnics. For the second point, he thanked those who firmly talked that Rohingya never exists in Rakhine region and their correct stances over corrects and wrongs concerning Rakhine issue. Moreover, he expressed thanks to well-wishers for their donations with patriotic spirit. He said their donations become physical and mental supports for the local ethnics. 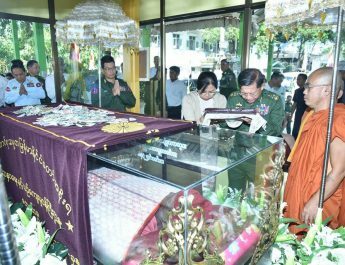 Next, the Senior General paid homage to Tipitaka Yanbye Sayadaw Bhaddanta Indapala of Yangon who attended the donation ceremony. 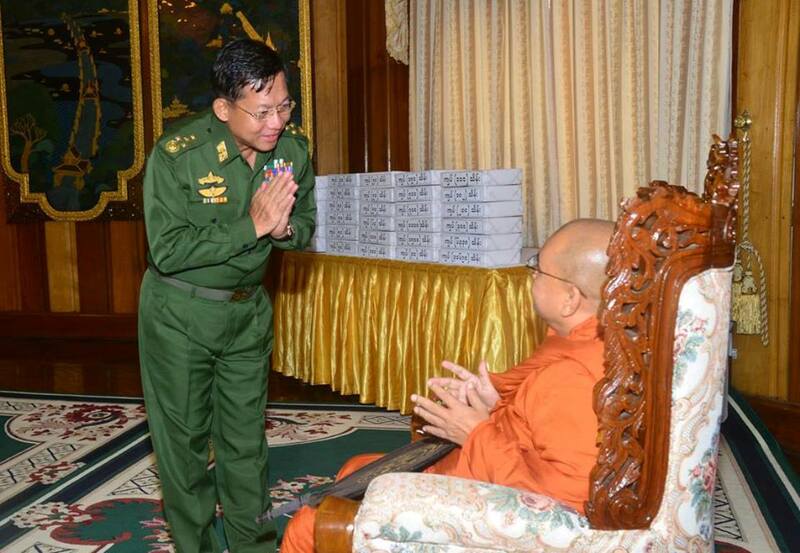 With regard to advice of the Sayadaw, the Senior General supplicated that the Tatmadaw will participate in rehabilitation and reconstruction of Rakhine State as much as it can. Then, the Senior General cordially met with Rakhine ethnic well-wishers from Phakant region. At the meeting with them, the Senior General said that it needs “strength” for Rakhine State for a long time. Local ethnics must safeguard and protect the country and their region. 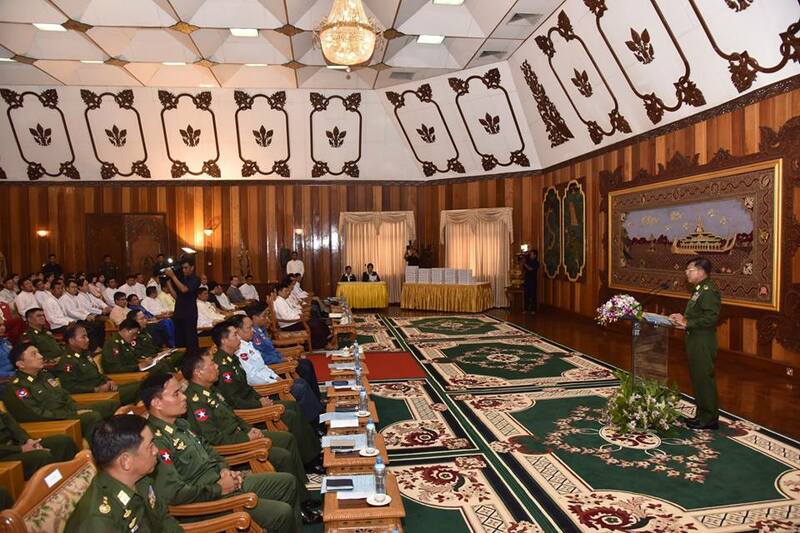 As such, the Senior General urged Rakhine ethnics to return home for carrying out regional development tasks as part of efforts to protection of the region. After that, the Senior General cordially greeted the well-wishers. At the second cash donation ceremony for security troops and departmental personnel discarging State defence and security duties at risk of sacrifice in Rakhine State and local people who fled from native places due to terror attacks of ARSA extremist Bengali terrorists and to carry out fencing at the border region, total amount of donations from well-wishers reached Ks-4,360.3 million.